The association of the FADS1 locus with arachidonic acid and metabolites on its pathway is one of the loci with the strongest association signal and it is a prototype for a genetically influence metabotype (GIM). Here we collect information from the literature about this locus as it becomes available .. revisit this post from time to time. NEWS: Functional variant underlying the FADS1 association identified – read “PATZ1 down-regulates FADS1 by binding to rs174557 and is opposed by SP1/SREBP1c” for more. NEWS: A recent paper on genome-wide patterns of selection in 230 ancient Eurasians (Nature, 2015) links genetic variants in SLC22A4 and FADS1 to the arrival of farming in Europe around 8,500 years ago necessitated adaptation to new environments, pathogens, diets and social organizations. Schematic view of the role of FADS1 in the synthesis of phosphatidylcholine. Long-chain poly-unsaturated fatty acids have to be produced from the essential fatty acid linoleic acids (C18:2) in the omega-6 fatty acid synthesis pathway (top figure) and from alpha-linolenic acid (C18:3) in the omega-3 fatty acid synthesis pathway (not shown). Un- and monosaturated fatty acids with chain lengths of up to 18 carbons, i.e. palmic acid (C16:0), stearic acid (C18:0) and oleic acid (C18:1) can be synthesized de novo in the human body. In the Kennedy pathway, glycerol-phosphatidylcholins (PC) with different fatty acid side chains are then produced from two fatty acid moieties (bottom figure). These are linked to a glycerol 3-phosphate, followed by a dephosphorylation step and the addition of a phosphocholin moiety. A very good review of the underlying lipid metabolism can be found in Vance (2001). Figures and pathways shown here were adapted from the KEGG database. 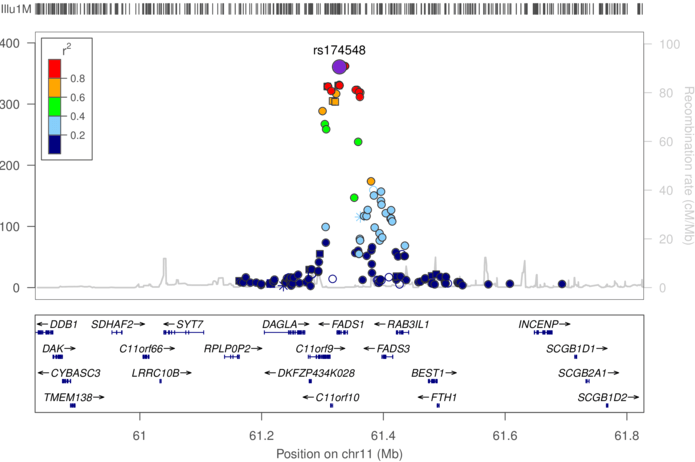 SNP rs174548, one of several SNPs that lie in a linkage disequilibrium block containing the FADS1 gene was strongly associated (up to p = 4.52×10−8) with a number of glycerophospholipid concentrations. This SNP explains up to 10% of the observed variance of certain glycerophospholipids. The FADS1 gene codes for the fatty acid delta-5 desaturase, a key enzyme in the metabolism of long-chain polyunsaturated omega-3 and omega-6 fatty acids. The minor allele variant of this SNP (MAF 27.5%) results in a reduced efficiency of the fatty acid delta-5 desaturase reaction, a fact that can be inferred from the following observations: the concentrations of numerous phosphatidylcholines (PC aa C34:4, PC aa C36:4, PC aa C36:5, PC aa C38:4, PC aa C38:5, PC aa C38:6, PC aa C40:4, PC aa C40:5), plasmalogen/plasmenogen phosphatidylcholines (PC ae C36:4, PC ae C38:4, PC ae C38:5, PC ae C38:6, PC ae C40:5), and the phosphatidylinositol PI aa C38:4 with four and more double bonds in their polyunsaturated fatty acid (PUFA) side chains are lowest in individuals that carry the minor allele of rs174548. In particular, the concentrations of the direct product of FADS1, arachidonic acid as well as those of its lyso-phosphatidylcholine derivative (PC a C20:4) are found to be significantly reduced with increasing copy number of the minor allele. 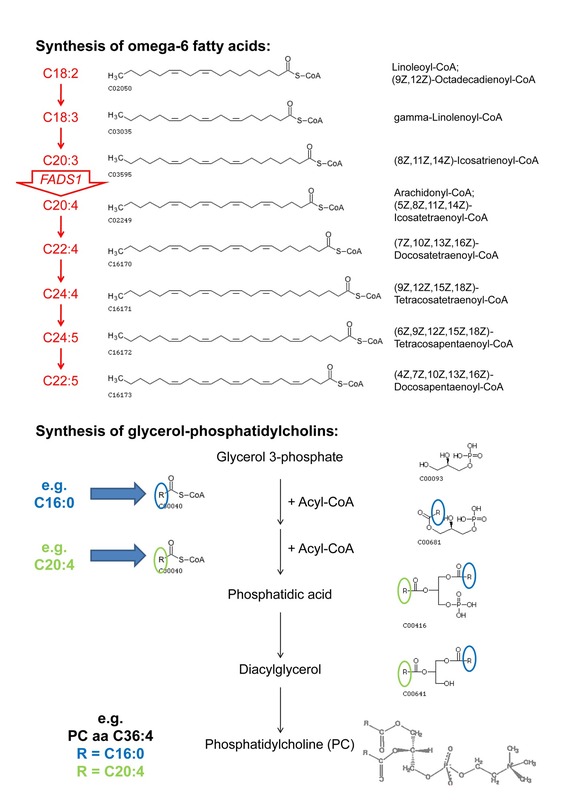 On the other hand, concentrations of glycerophospholipids with three and less double bonds in their PUFA side chains show a positive association with the FADS1 genotype. These metabolites include the phosphatidylcholines PC aa C34:2 and PC aa C36:2, the plasmalogen/plasmenogen phosphatidylcholines PC ae C34:2 and PC ae C36:2, the phosphatidylethanolamines PE aa C34:2 and PE aa C36:2, and the phosphatidylinositol PI aa C36:2. The negative association of the sphingomyelin concentrations (SM C22:2, SM C24:2, SM C28:4) can be interpreted as being a result of a changed homeostatis of phosphatidylcholins, since sphingomyelin can be produced from phosphatidylcholine by the action of the sphingomyelin synthase. Similarly, the negative association of the lyso-phosphatidylethanolamin PE a C10:0 can be considered a consequence of the overall changed balance in glycerophospholipid metabolism, since this metabolite can be produced from different phosphatidylethanolamines by abstraction of an arachidonic acid moiety. In summary, we can conclude that the direction of all those associations can be explained by a modification in the efficiency of the fatty acid delta-5 desaturase reaction. Regarding the stricken-through part in the above quote, I reckon today that the identity of the metabolites is a misannotation of these molecules, likely due to an overlay from signals of C13 isotopes (a correction for this effect was introduced by Biocrates only later). We have previously shown that analyzing ratios of metabolite concentrations may strongly reduce the variation in the dataset when a pair of metabolites is closely connected to the direct substrates and products of a given enzymatic reaction. When a tested SNP impacts the efficiency of such a metabolic reaction, using concentration ratios leads to drastically decreased variance, and, consequentially, strongly decreased p-values of associations. Such a dependency not only provides rational evidence for a positive association, but also points to potentially affected metabolic pathways, as we demonstrate here for the example of the FADS1 case. We find that by using metabolite concentration ratios, the p-value of the association with the polymorphism in the FADS1 gene decreases by up to fourteen orders of magnitude. Eicosatrienoyl-CoA (C20:3) and arachidonyl-CoA (C20:4) are the direct substrate and product of the delta-5 desaturase reaction, which is catalyzed by FADS1. Synthesis of these metabolites to a glycerol 3-phosphate, and further addition of a palmitoyl-moiety (C16:0), followed by a dephosphorylation step and the addition of a phosphocholin moiety, leads to the formation of the glycerol-phosphatidylcholins PC aa C36:3 and PC aa C36:4, respectively. PC aa C36:3 and PC aa C36:4 can thus be considered as modified substrates and products of the delta-5 desaturase reaction. If the catalytic activity (or the protein abundance) of FADS1 is reduced by a polymorphism in its gene (or in a regulatory element), more eicosatrienoyl-CoA (C20:3) and less arachidonyl-CoA (C20:4) is available for the synthesis of those glycerophospholipids that contain these fatty acids. This translates for example into increased PC aa C36:3 concentrations and reduced PC aa C36:4 concentrations. Thus, the ratio between the concentrations of the product-substrate pairs of the delta-5 desaturase reaction, such as [PC aa C36:4]/[ PC aa C36:3], will be a strong indicator for the efficiency of the FADS1 reaction. Glycerophospholipids with three double bonds do not associate with the FADS1 polymorphism (p-values ranging from 0.92 to 0.077), whereas the corresponding glycerophospholipids with four double bonds generally display strong associations (most p-values ranging from 10−3 to 10−8). When considering the ratios between concentrations of matched metabolite pairs, the association with the polymorphism in the FADS1 gene increases by up to fourteen orders of magnitude (p-values below 10−21). This effect is observed not only for one, but for a number of different glycerophospholipid species (PC, PE, PI, incl. plasmalogen/plasmenogen phospholipids) which are thus very likely composed of an arachidonyl-moiety (C20:4) and either a palmitoyl- (C16:0) or a stearoyl-moiety (C18:0), respectively (except for lyso-phosphatidylcholin PC a C20:4, which is formed from a single arachinodyl-moiety). The strongest effect size is observed for phosphatidylcholine diacyl C36:4 (PC aa C36:4) to phosphatidylcholine diacyl C36:3 (PC aa C36:3) ratio (p = 2.4×10−22). These metabolites are major constituents of the cell membrane. Here, 28.6% of the total variance in the population can be explained by this SNP. If the molecular function of FADS1 had not been already known, the association between the SNP and the different glycerophospholipid concentrations per se would have allowed to deduce its enzymatic activity of inserting a fourth double bond into long-chain fatty acids. In a much larger GWAS we replicated the FADS1 association using the Biocrates p150 kit. The following paragraph is from the Supplemental Text of Illig, Gieger et al., A genome-wide perspective of genetic variation in human metabolism, Nature Genetics, 2010. FADS1: Very long chain polyunsaturated omega‐3 and omega‐6 fatty acids (PUFAs) are essential building blocks of the different phospholipids, which constitute the cellular and organellar membranes. Starting from the omega‐6 linoleic (18:2) and omega‐3 linolenic (18:3) acids, which cannot be synthesized de novo in the human body, higher order PUFAs are formed by a succession of elongation and desaturation reactions. The Fatty acid desaturase 1 (FADS1) enzyme plays a central role in this process, as its product, arachidonyl‐CoA (20:4), is also crucial for the inflammatory eicosanoid and prostaglandin pathways. Arachidonyl‐CoA is produced in a FADS1‐catalyzed reaction from eicosatrienoyl‐CoA (20:3) by the insertion of the fourth double bond. The association of the FADS1 locus with ratios between three‐ and fourfold unsaturated phospholipids has already been described previously. This locus presents the strongest association in this study with the ratio PC_aa_C36:3/PC_aa_C36:4 (p=6.5×10‐179) and PC_aa_C38:4 concentrations (p=1.6×10‐47). The fatty acid side chains of lysoPC_a_C20:4/lysoPC_a_C20:3 (p=1.1×10‐117) correspond most unambiguously to an indirect substrate/product pair of the FADS1 reaction. However, we did not measure fatty acids directly in this study. It is therefore interesting to note that a recent genome‐wide association study (InCHIANTI), where plasma polyunsaturated fatty acids were directly measured, has identified an association of the FADS1 locus with arachidonic acid , thereby confirming our deduction that the nature of the associating metabolite pairs reflects the enzyme’s function. Regional association plot for the FADS1 locus with the arachidonate (20:4n6) / dihomo-linolenate (20:3n3 or n6) ratio. Suhre et al., Human metabolic individuality in biomedical and pharmaceutical research, Nature, 2011. Shin et al., An atlas of genetic influences on human blood metabolites, Nature Genetics, 2014. In particular, we found in the latter study an exceptionally strong association between the ratio of the direct substrate/product pair of FADS1: arachidonate (20:4n6) / dihomo‐linolenate (20:3n3 or n6). The full association data for these Metabolon studies is available online on our GWAS.EU site (see this post for details on gwas.eu). To find out more about the rs174548 and what is known about this locus, use the “Block Annotation” of our SNiPA server. Enter the SNP identifier, or click “load example” (this loads SNP rs174547, an alternative SNP for the FADS1 case), and hit “Start processing this job” (see this post for details on SNiPA). You shall find a number of disease associations at this locus, overlay with eQTL and Encode data, and thereby potential candidates for causative variant(s). Enjoy!